It’s really very simple – no team orders. For those of you who don’t follow Formula 1 racing, but care enough to have read this far, here is the simple version. This is individual competition. Yes, each team has two drivers, but they are intended to compete against one another. This is especially important for the audience, as we get to see what a driver is really made of when he goes wheel-to-wheel against his teammate in an identical vehicle. Yes, there is a “constructor’s championship” which means the team with the most points, but the true glory is the driver’s championship. That is where the beautiful dance of man and machine comes together to form the poetry that is F1. The problem arises when a team with one driver ahead in the points has it’s other driver ahead in the race. “Team orders” refers to the race-leading driver giving way to the points-leading driver in order to give that particular team the best chance of winning the driver’s championship. It’s been an interesting year Ferrari. After being historically dominant between 1999 and 2004 (winning every constructor championship and 5 out of 6 driver championship with Michael Schumacher), the prancing hoarse had not much pace in 2009. This year, the results have been mixed with the team ending up on the podium only three times up until the German Grand Prix this past weekend. But going into Hockenheim, there was every indication that drivers Massa and Alonso would have fast cars to compete with Red Bull and McLaren. Those reports proved true with the cars qualifying 2 and 3 behind Sebatian Vettel’s Red Bull on pole. Felipe Massa is an incredibly gifted young driver from Brazil. He carries the weight of millions of Ayrton Senna fans from his homeland who live and breath the sport to honor the departed hero. He got ahead of his teammate, two-time world champion Fernando Alonso and made his way to a comfortable, as passing can be quite difficult in this sport unless someone makes a significant error. Massa is not prone to such errors. And yet, with 21 laps remaining in the 67 lap race, he received a notification that the 2d place Alonso’s car was faster (an outright lie as fuel and set-up were, for all intents and purposes identical) and that he should let the Spaniard pass. Massa dutifully got out of the way and Alonso drove on to the checkered flag. For this flagrant violation, Ferrari has been fined $100,000, but with no loss of points for either driver or team. I agree with the rules to the extent that I want to see if Massa is strong enough to hold off a VERY determined Alonso. I see that it’s much better for Ferrari’s hopes of getting the greatest benefit in both the constructor’s and driver’s championships, but that does not take away from the shameful way that the team ignores the rules. That’s blatant arrogance, and this is not the first time. The fans deserve to see the drivers race. 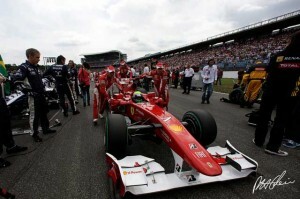 This entry was posted in Motorsport and tagged ferrari, Formula 1, team orders by mpomy. Bookmark the permalink.